HomeZ_ForumCouncil WisdomThe Watcher’s Forum: Should The U.S. Pull Out Of Afghanistan And If So, How And When? The Watcher’s Forum: Should The U.S. Pull Out Of Afghanistan And If So, How And When? As you know, the Watcher’s Council represents the cutting edge of political thought in the blogosphere. You already read their weekly offerings on the issues and if you’re really on the ball, read their incisive and stimulating sites. With that in mind, as a regular item we’re going to feature Council members ( and some very interesting non-Council guests) presenting short takes on the day’s important issues as they come up. Today, the Watcher’s Council weigh in on whether the U.S. should pull out of Afghanistan, and if so, how and when. Bookworm Room: The response to that question depends on the goal. If America wants to trounce the Taliban, destroying a dangerous enemy and sending a strong message to other Islamists around the world (including those sitting on the nuclear bomb in Pakistan) it should stay in Afghanistan until it achieves a decisive victory there. Of course, that would require a complete change in the rules of engagement, one that doesn’t make our troops sitting ducks but instead allows them to fight a war to a victorious conclusion. Alternatively, if the goal is just to leave with our heads held high, it’s too late for that, and we may as well leave ASAP, before any more American lives are lost. I would not, however, give the enemy the courtesy of knowing our withdrawal schedule. I’m pretty sure though, that in true Groucho tradition, whatever Obama is for, I’m against it — because it does seem that whatever he’s for is also against America’s best interests. The Noisy Room: Yes, the US should pull out of Afghanistan as soon as possible. Our current government will not allow our bravest to do what they do best, which is win. Since they cannot ‘break things’ and just win the war, the conflict becomes never ending and a death trap for our soldiers and a massive drain on our defense resources. Bring them home – they are being literally surrounded by the enemy and Obama could very well leave them in the lurch at some point and that would be a death sentence for most of them. Don’t give notice – just leave and let the barbarians kill each other off. They are really good at that. Joshuapundit: There was never anything to ‘win’ in Afghanistan. One needs merely to look at how this war was approached from the beginning to see that. In the future, it will be seen as a strategic folly of historic proportions, and one unworthy of the brave men and women who fought there. There were two presidents responsible for it; one out of the need to need to appear to be retaliating for 9/11 by attacking some of the subcontractors while avoiding the inconvenience of confronting the real financiers, directors and perpetrators of jihad, the other to cover for his ignorance, hubris and rhetoric on the campaign trail. Both have wasted American blood and treasure in a criminally negligent fashion, and I only hope that one day both of these presidents will be subject to harsh judgment by history. Retreating from a landlocked country surrounded by hostile territory is not going to be merely a matter of just leaving, especially with our relations with Pakistan at the point they’re now at. I doubt that the Karzai government will hold on until 2014, and it’s a good bet that the Afghan Army will be firing at our troops with the weapons we gave them as we leave..they’re already doing it. It may very well be a fighting retreat for the last units out, with horrendous scenes reminiscent of Saigon, especially as President Obama’s ‘vision’ becomes reality, most of our troops are pulled out and the Afghans take over and revert back to their preferred 7th century way of life. All the Taliban need to do is wait. Simply Jews:Not an easy question for me, seeing as Israeli troops will be never allowed to participate in the war against the Taliban. But still: I am more than sure that the moment the coalition forces leave Afghanistan, the Afghani Taliban, aided by their Pakistan brethren, will be back, more violent and fanatic as before. And that Al Qaeda will get their favorite training and preparation grounds back. I am certain that leaving without a decisive victory, where Taliban both in Afghanistan and in Pakistan tribal areas is destroyed, will get us back to pre-9/11 situation. Oh well, maybe with a bit more awareness and alertness – but awareness and alertness don’t last, while terrorism does. Rhymes With Right :Unfortunately, the time has come for us to leave Afghanistan. Why? Because of a policy failure that dates back to the Bush years and upon which the Obama Administration has doubled-down. We should have crushed the Taliban as quickly as possible, and not accommodated conservative Islam. Instead, we adopted a policy that involved simply pushing back the Taliban and working with their opponents, even if they were corrupt and supported the same sort of regressive social and religious policies that have returned Afghanistan to the category of backwards Third World Islamist cesspool. Instead we have installed and supported a kleptocrat regime that plays both sides of the fence and which cannot survive, while placing our troops in harms way to no good purpose. I wish i could say that failure was all on Bush — after all, he started it — but the Obama policy has been to risk more lives with less clear objectives and less strong rules of engagement. The Independent Sentinel: I want them to stay until November in the event that we have a new President who might be able to salvage a victory that would leave the Afghans safer. We should not be leaving without establishing a base though the President is planning on doing exactly that. If Obama is voted back in, I want my military back home and out of harm’s way. When the Taliban return, the day after our soldiers withdraw, the women and children will once again be relegated to a life of abuse. The US government is pretending they are negotiating with good Taliban as they attempt talks with a terrorist who was a friend of Osama’s and is a friend of al Zawahiri’s.. Afghan soldiers they train cannot be trusted and, we don’t hear about it in the news, but they still are killing our soldiers. That’s no way to fight a war. It’s not reality- based. The Glittering Eye: Afghanistan does not have the social or economic capacity to support a military of the size and capability that would be required to prevent a return to the conditions that prevailed there in 2001 and will not have for the foreseeable future. It will require substantial U. S. financial, logistical, and air support on an indefinite basis to maintain an Afghan force with the capabilities required and, due to the failures of both the Bush and Obama administrations to cultivate support for such an indefinite commitment, there is little political support for it. The workable alternatives for Afghanistan continue to be what they have been for the last decade: either we maintain a military presence in and financial support for Afghanistan for the foreseeable future or we leave Afghanistan to its own devices, prepared to uproot any resurgence of its former terrorist camps periodically in robust, brief, largely air campaigns. Without support for the former it must be the latter and we should implement our departure with all due speed. I also believe that we should work with allies to isolate AfPak really and truly. IMO Al Qaeda’s ability to turn Afghanistan into Disneyland for terrorists was not because Afghanistan and Pakistan were isolated but because they were insufficiently isolated. If the Chinese want it, they can have it. But that’s a discussion for another time. The Right Planet: To put one more life in harm’s way, without any clear objective, is criminal. During the Vietnam War, the U.S. lost some 60,000, and countless Vietnamese, in a long, bloody, drawn-out struggle that lasted for fifteen years–which bled our nations’ youth, drained our treasuries, demoralized the people–which made the ground fertile for social upheaval. There was no clear strategy throughout the war–only nebulous concepts of “winning hearts and minds”–like we see now in Afghanistan. This is not the fault of our military. This is the fault of our civilian leadership–namely, the Executive Branch–for giving our military–specifically, the Joint Chiefs of Staff–no clear definition of the enemy or what victory would entail. We went into Afghanistan to depose the Taliban; now they’re poised to come back stronger and emboldened once we withdraw. Additionally, we have adopted the “fortress mentality” at the strategic level and allow the enemy–the Taliban and others–to control the countryside, i.e. the country, period; and we’ve been there for ten years! We are breaking the backs of our military by not allowing them to achieve victory over the enemy. Besides, if the U.S. is not willing to deal with Pakistan and Iran for their role in supporting the Taliban, then we’re just pissin’ in the wind. 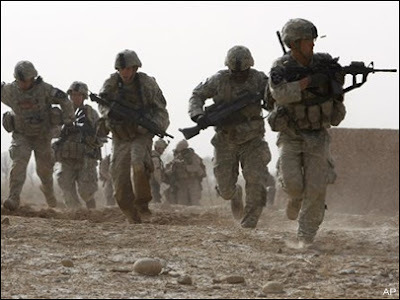 Watcher of Weasels » Head To head: Should The US Pull Out Of Afghanistan? And If So, How And When?